I just finished watching "Kill Oscar! ", a three-part crossover story comprised of two episodes of The Bionic Woman and one episode of The Six Million Dollar Man. These are the infamous "fembot" episodes that so terrorized children of the 1970s, myself included. When Steve Austin or Jamie Sommers ripped the face off one of these robot women, the ghastly electronic visage and creepy, soulless computer sound effects were the stuff of guaranteed nightmare fuel. Now that I'm all grown up (after a fashion), I'm not scared of the fembots anymore, though I do find them somewhat unsettling even now. It's the eyes, I think, and that horrible speaker grille that acts as an ersatz mouth. "I call them my fembots. The perfect women...programmable, obedient, and as beautiful or as deadly as I choose to make them." Franklin, a former OSI scientist, plots revenge on his former employers and arranges to replace OSI secretaries (there apparently being no women in any positions other than secretarial - this is the 70s, after all!) with his fembots. 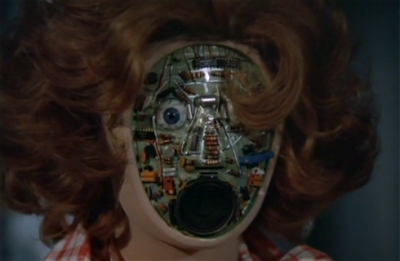 The fembots infiltrate OSI and kidnap its head, Oscar Goldman. Franklin hopes that he can convince Goldman to give up the secret of the OSI's new weather control technology (! ), but of course Goldman would never do that. In fact, in what I thought was a rather cool twist, Oscar has left behind videotaped orders to be played for Steve, Jamie and the assorted OSI head honchos: in the event of his capture, all OSI resources are to be devoted to his assassination so that he can't give away any secrets. So the "Kill Oscar!" title is clever misdirection; viewers must have assumed that the titular directive comes from the bad guys, but in fact it comes from Oscar himself, and Steve and Jamie may very well be the agents assigned to the job. Of course it doesn't turn out that way - these shows never got quite that dark, however creepy the fembots may have been. The first one and a half episodes are full of juicy paranoia as the leads attempt to figure out which of their friends has or has not been replaced; the latter half of the story is a daring action-adventure rescue plot, with plenty of bionics-vs.-robotics action. In many stories of this nature, the villain would die at the end, a victim of his own madness or hubris. And in fact Houseman's Dr. Franklin attempts to go down with his metaphorical ship in the final minutes, but Jamie (Lindsay Wagner, who played Houseman's daughter in The Paper Chase) refuses to let him die, risking her own life to save the villain and bring him to justice - and perhaps even mercy. And this, to me, is why these shows remain important - not for their cheesy SF trappings, but for the very real goodness and empathy expressed by not only the leads, but their OSI colleagues. Steve, Jaime, Oscar, Dr. Rudy Wells - these are all clearly the Good Guys, and over the course of dozens of episodes their altruism and decency is utterly unfailing. These days, that kind of storytelling might seem simplistic or naive, and perhaps there's some truth in that. But even for a show rooted in sci-fi action, the show producers, writers and actors clearly wanted to send positive messages about honesty, tolerance and solving problems with as little violence as possible - even when they're using their bionics, Steve or Jamie almost always use their powers to immobilize, stun, or just embarrass their foes. The short-lived Bionic Woman revival of a few years back failed, I believe, because the producers tried to make Jaime a typical darkly ironic, self-loathing, "complex" character thrust into a shady world of betrayal and double-dealing. It seems that these days we can't have heroes who are simply heroes - Steve the astronaut, Jamie the schoolteacher, Goldman the dedicated public servant/bureaucrat (can you even imagine a hero bureaucrat on television in today's government-is-inherently-bad zeitgeist?). And yet I would argue that good-hearted, idealistic folk like Steve, Jamie and Oscar are more realistic than the angst-ridden protagonists of today's drama, if only because I've known a lot more people like Steve and Jamie than I have the new bionic woman or, say, any of the characters on The Shield or Dexter (and don't get me wrong; I do love those shows). I believe there's still room for old-fashioned altruism in television and film, if for no other reason than people still need role models. Real people - parents, scientists, artists, philanthropists and so on - can fill some of that need. But for unambiguous displays of essential human values in narrative form, stories about genuine good guys can't be beat. I wouldn't be the person I am today had I not seen Jamie rescue Dr. Franklin, or Superman forgive Lex Luthor, or Tarzan dish out justice against slavers. In a complex world, we need to be reminded of the simple universal human values that have the power to help us face our most daunting challenges: cooperation, trust, compassion, critical thinking, honesty and love. Against all that, fembots don't stand a chance. You Seem Wise, for a Woman: Gender Roles in Star Trek's "Who Mourns for Adonais?"